Italian jewelry line founded by Greek immigrant Sotirios Voulgaris in 1884. The 'v' in the name is simply the Roman rendering of the letter 'u', so the name is really "Bulgari", and is pronounced as such. 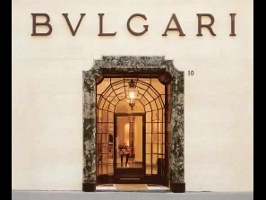 Bvlgari has expanded from their original roots in jewelry to encompass leather goods, eye wear, and even hotels and resorts. As of 2011, Bvlgari is part of the LVMH (Moët Hennessy Louis Vuitton) stable. Bvlgari's first fragrance was 1992's Eau Parfumée au Thé Vert, created by perfumer Jean-Claude Ellena. Subsequent releases include Pour Femme (1994, relaunched in 2006 with Kate Moss as spokesmodel), Pour Homme, Black (1998), Blv (2000), Blv Pour Homme (2001), Thé Blanc (2003) and Omnia (2003) among others. Bvlgari perfumes are sold at major department stores, or online at the various fragrance discounters. See all articles on Now Smell This tagged Bvlgari, or take a look at our collection of Bvlgari fragrance commercials.